Pescavores, how cool is that? One of the apps I always missed is here now - the Seafood Watch app which can tell you what is responsible to eat and what would be better to avoid. It even proposes alternative fish to look for. The included "fish map" tells you where to get sustainable fish just around you, at fishmongers and restaurants alike. The app includes a sushi section and keeps you up to date with health advisories issued by the Environmental Defense Fund, scientific reports and even seafood recipes. Great, thanks, Monterey Bay Aquarium! - Bluefish, for example, is alternatively named horse mackerel. Surprised by that I entered horse mackerel in the search mask and landed (correctly) at bluefin tuna. - The map lacks a distinction between fishmongers and restaurants. There are NO fishmongers in my neighborhood (check zip codes 10003 and 10009), but way to many restaurants. But it doesn't recognize the millions of fishmongers in Chinatown either. - The app is pretty wishywashy about which businesses are elected to be on the fish map. Just if at least one "good" fish is being served brings your restaurant/fishmonger on the map? That can't be it. "Sustainable" means more to me. Nevertheless I love this app, quite helpful. Dome clock Lincoln Center, a photo by jankor on Flickr. 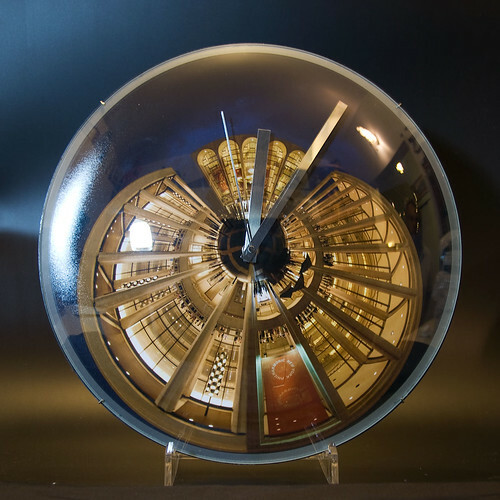 Unique, hand made and now available for purchase: Glass dome clocks, other wall clocks and alarm clocks. Come and check them out on my Flickr page. For years, graphic artist Normal Bob Smith covers the weirdos on Unions Square on his blog. Eventually this earned him an article in the New York Times. In Taking a Gander at the Peepers in Union Square Park, Corez Kilgannon reports about the TV show "Inside Edition" peeping on the peepers. Similarly weird: moneb888#s skate videos from Union Square Park. 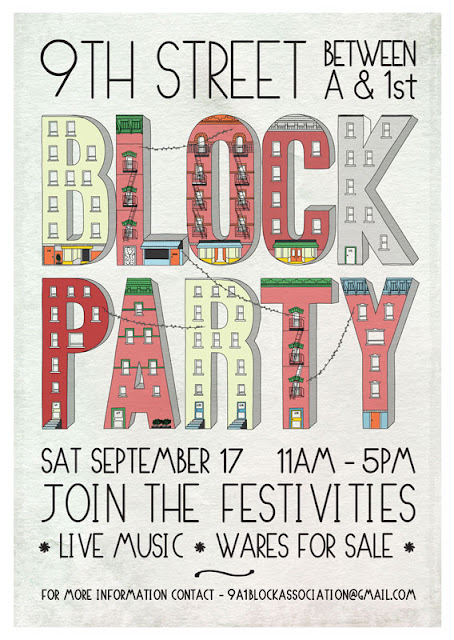 Block Party! With my photography! Time: 11 am to 5 pm, no rain date. • We have plenty of live music all day long! • Resident artists, crafts people, and photographers will be showing and selling their work. • Residents sell "stoop sale style" antiques, bric-a-brac, clothing, accessories, jewelry, records and more. • A raffle with gifts, discounts, and coupons from businesses on our block (list below)! But there is so much more to see, come and join us one of the most pretty blocks in the neighborhood just west of Tompkins Square Park in the heart of the East Village. • The first time I will offer some unique time pieces: little planet wall clocks of different sizes! • I take orders for prints from the series "Guess Where in New York". • I also take orders for my book "Guess Where in New York"
• L at First Avenue: Walk five short blocks down and turn left at P.S.122! - Kajitsu: Shojin cuisine, an ancient Japanese cuisine developed in Zen Buddhist monasteries. - Whitman's: American Slow food & drink, done right. - Zucker Bakery: The newest kid on the block! My Sowester makes me look a bit like a Gloucester Fisherman, doesn't it? Bluefish is an abundant and ubiquitous species in the Long Island Sound - except when I am aboard the C&C 30 "Mistral IV". Two cocktail blues was the meager harvest over the course of three days, but at least they were expertly lured, caught, filleted, grilled, prepped and served by Bro. Originally the trip should lead us from Larchmont, NY, along the Long Island Sound to the Thimble Islands in Connecticut, but unfortunately the weather denied us this pleasure. Seeing nothing bit rain ahead, we cut the trip short to save us from being rained on for two days in a row with no dry time at the end of the trip. The first day we set out from Larchmont Yacht Club to sail to Zieglers Cove, a hidden gem on the Connecticut shoreline, with public moorings provided by the town of Darien, CT, in this little nook which surrounding land mass land belonged to the king of baking powder William Ziegler. Moderately protected from wind and waves, we nestled between rocks in this mosquito paradise. After a day with SW winds 5-10 kts we met with our friends to raft up with the cat rigged Nonsuch 30 "Aloki" (pic, pic) and the sloop Bénéteau 42 "Allumer" for the combo of Asian chicken and glass noodle salad and German Bratwurst from the grill. Metaxa and Ouzo were moderately consumed and after hours every boat picked her own mooring. There were about a dozen power boats with families around, everybody having a little party - it was labor day weekend after all! I strongly recommend to stay in this bay during the off-season, September and October are wonderful if you want to be on your own here - as we have done it before. 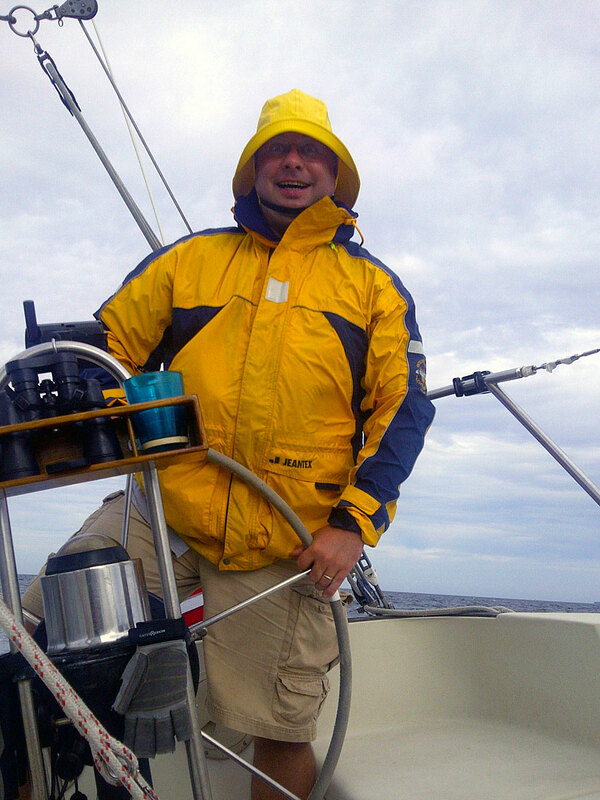 Day two started out pretty windless, just in the early afternoon the wind picked up to about SW 10 kts. We crossed the Long Island Sound to sail to Long Island's North Shore and raft up with our friends in Port Jefferson, NY. The geography offers beautiful anchorages right behind the harbor entry. Shallow and badly charted, the private navigation aids help a lot - DO NOT rely on the latest NOAA charts since they are quite inaccurate here. A lot of dredging was going here on since the last soundings a while ago. But once you are in and were able to avoid the ferries between Bridgeport and Port Jeff, you are in safe and quiet waters. Again we rafted up with "Aloki" and "Allumer" and after some lamb sausage and octopus salad, Bro served first the grilled bluefish with a dill-mustard sauce, and then a "Germanoid" Sauerbraten with red cabbage and sweet potatoes, accompanied by an American Gewurztraminer and Bitburger Pilsener. Coffee, Rum and cookies put the lid on. Everybody dropped his own anchor afterwards. Unfortunately we didn't see the town of Port Jeff the next morning, because fat grey clouds came close pretty quickly and we decided not to lose more time than necessary before our departure. Ok, next time. Looks interesting enough to make landfall for a cuppa Joe. Day three meant the end of our original plans to fork through the Thimbles. The National Weather Service predicted two full days of heavy rain ahead, and nobody wanted to face that except Stephen and Barbara on "Allumer", who decided to spent one day at the Brewer's Marina in Westbrook along the Duck Islands Roads, just a tad east of the Thimble Islands. "Aloki" wanted to hunker down in the sand hole at the tip of Oyster bay. The "Bronco Buster" crew on "Mistral IV" decided to return home, facing mostly winds of 15-20, in gusts up to 25 kts SW. So we were in for a choppy trip home, interrupted by some good lunch (pasta with pesto), when we stopped dead in the middle of the sound, took down the jib and heaved-to while boiling up our meal. The selected heave-to setup conveniently carried us a bit upwind, so the next leg was much easier. I just love it when I have space to fall off to my convenience and don't have to pinch to reach my next waypoint. Body and mind fortified, we made the wise decision to bind the first reef on the mainsail and keep about 20 percent of the jib in, but we were still good for a top speed of about 7 kts upwind (though overground with and incoming tide). Coming home to the LYC showed us once again, how vulnerable the harbor is at SW winds. The boats on the moorings were shaking and rocking and you are well advised to tie your rudder down. The tropical storm Irene, which came through here just a week before, pushed off the protectors of our two mooring lines and nearly chafed one of them through. But what a bummer - it seemed that the bluefish had their luncheon around the same time as we did, since all our trying to get dinner together were fruitless. But I swear: We'll be back again - and soon! Bluefish beware!